IBM equipment tends to have 4-digit model numbers, and it is a great trivia game to see who can keep the numbers straight. This page is an attempt to provide a reference. While the entries in this list sometimes provide links to pictures, many more pictures are found at Computing at Columbia Timeline by Frank da Cruz. The pictures at the "nfrpartners" address belong to John Coelho. I hope they stay available there. There is a longer list of number in this file which I am still studying. Finally, this is a list from IBM Brazil. The 026 was used in the 70x and 70xx era. Keypunch: To enter data onto 80-column punched cards. I (Lars Poulsen) used these in 1970 at Copenhagen University. 650 cards per minute, mechanical feed, regular card hopper, 13 pockets. 1000 cards per minute, mechanical feed, regular card hopper, 13 pockets. 2000 cards per minute, vacuum feed, long card feed ramp. Numeric printing tabulator (1933). Photo and description at http://www.columbia.edu/acis/history/285.html. Alphabetical accounting machine (1934). Photo and description at http://www.columbia.edu/acis/history/405.html. Accounting machine ("tabulator") (1949). Photo and description at http://www.columbia.edu/acis/history/407.html. 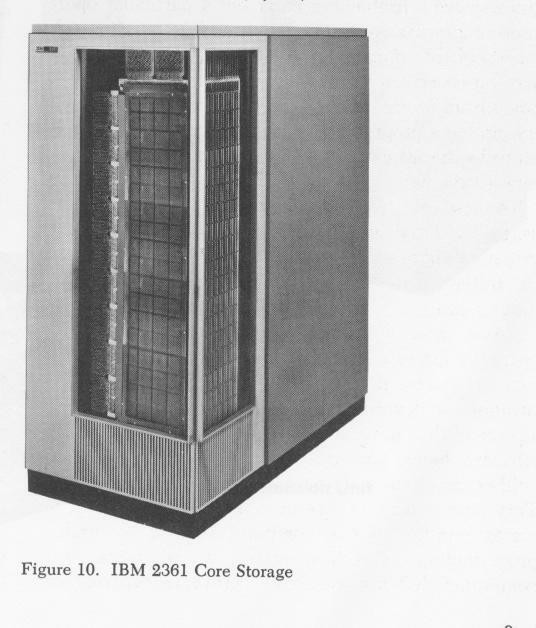 Remained the main workhorse until the 1401 computer became available in 1959. 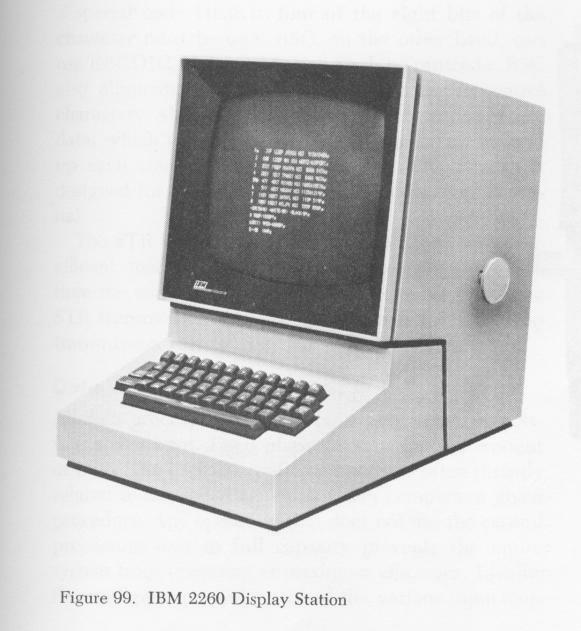 Used as an offline printer for the IBM 1620 computer. Main storage was a drum, each instruction contained the address to jump to for the next instruction. The SOAP optimizing assembler took care of placing the program so that the next instruction would be ready to read just in time (accounting for the varying amounts of time each instruction took to execute). The 709 was a vacuum-tube realization of the same architecture that was later built in transistors as the 7090. 200 BPI 75 IPS 7 track tape drive. Used with 650. Papertape punch. Originally developed for 1401, but available as RPQ feature for S/360. Jim Saum recalls that there was no support for it in the OS/360 system software, and his shop had to write a user-mode EXCP driver for the punch. "The 1012 was impressively overbuilt. It was a reel-to-reel punch in a cabinet about the size of a medium refrigerator. There were tension arms on both sides between the supply and takeup reels and the punch/read heads. Punch speed was 150 cps. The device was acquired for an application that regularly required punching dozens of reels of aluminized mylar tape. Prior tests showed that other punches didn't endure this gracefully." Console printer. Used in 1130 computer system. Also, part of the console typewriter on many IBM360 systems. I used this in 1970 at Copenhagen University. Disk pack for 2311 drive. 7.25MB. Data processing system. The 1401 designation was used both for the system and for the CPU frame. Long feed ramp. Looked a lot like the 2540, which was the corresponding unit for S/360. Like the 2540, it had 5 stacker pockets: The middle one could be addressed both by the reader and by the punch. Line printer with horizontally rotating type chain/train. Fast, robust and better print quality than the vertically rotating drum printers used by other manufacturers during the same time. The chain design allowed one to change to different character sets for different print jobs: Upper/lowercase for document processing or uppercase-only (or even numeric-only) to increase speed. (The operating system would then replace the table in the printer that mapped chain position to character codes at the same time.) One of the most endearing features was how it hydraulically raised the cover when it ran out of paper, thus easily alerting the operator across the room that it needed attention. 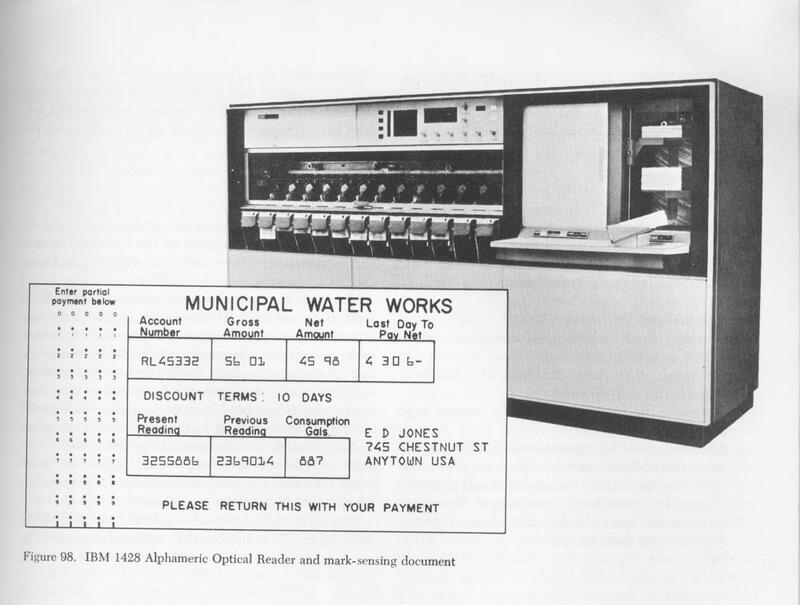 The 1403 was available in several models; the 1130 system could use a simpler 600 lpm version, while the System/360 family used the full-featured 1100 lpm model N1 shown in these pictures.. I saw this in 1970 at NEUCC, Copenhagen. MICR reader/sorter. Read 2000 checks per minute. Used by large banks and by inter-bank clearing centers. Data Processing System, seen here. Card reader/punch, used first on 1440, later on 1130 and S/360. A single input hopper fed a card path with first a read station then a punch station, and finally two selectable output stackers. Reading at 300 cpm (M6) or 400 cpm (M7), punching at about 50 cpm. Photo at Howard Shubs' Website. There was a CDC 1620 - was there also an IBM 1620? I saw a 2250 in 1971 at NEUCC, Copenhagen. 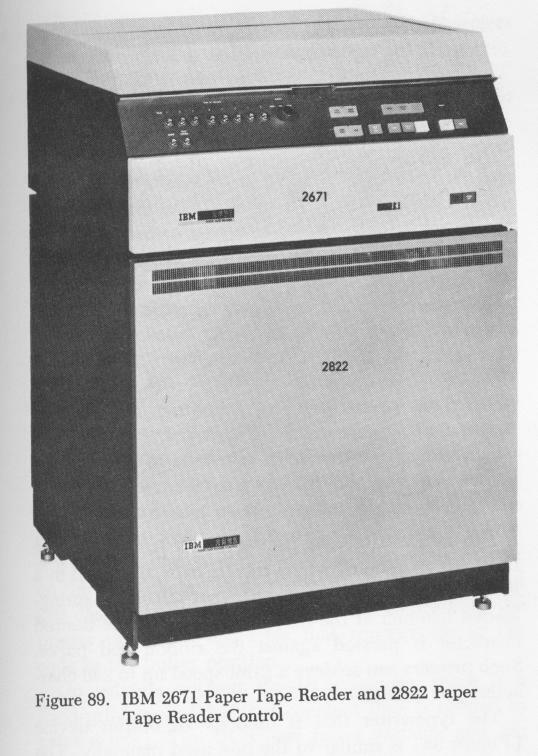 The cluster controller for the 2260 dilpsays was the 2848. 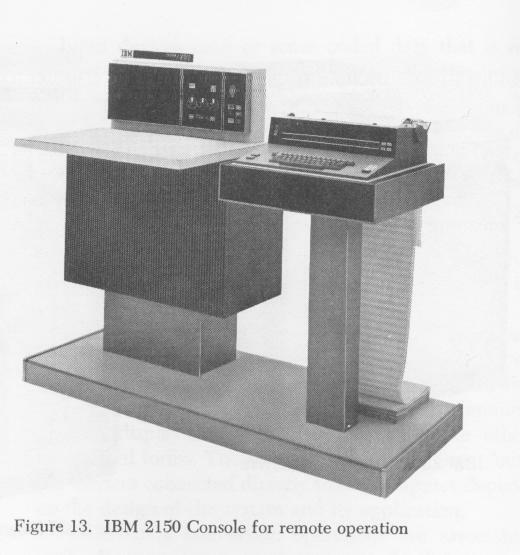 I saw 2260s in 1971 at NEUCC, Copenhagen, where they were used as auxiliary consoles for the 360/65 in user areas. Removable pack disk drive - 7.25MB. 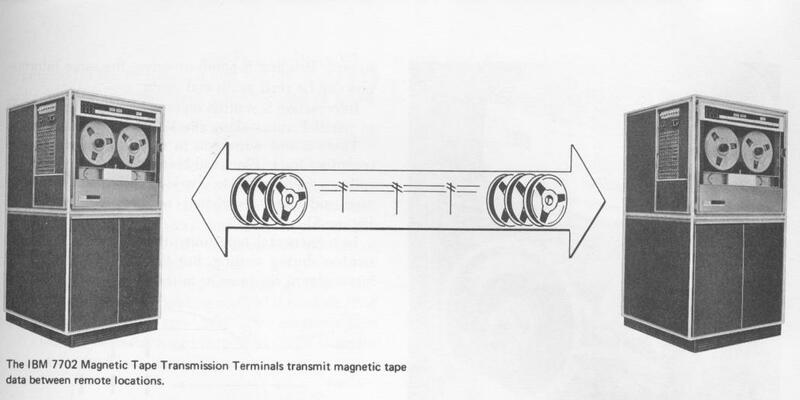 Data Cell - a storage device where data is stored on magnetic strips in long slender bins. The right bin is rotated into position, and then one strip is dropped, picked up by suction and wrapped around a drum, and returned to the bin. 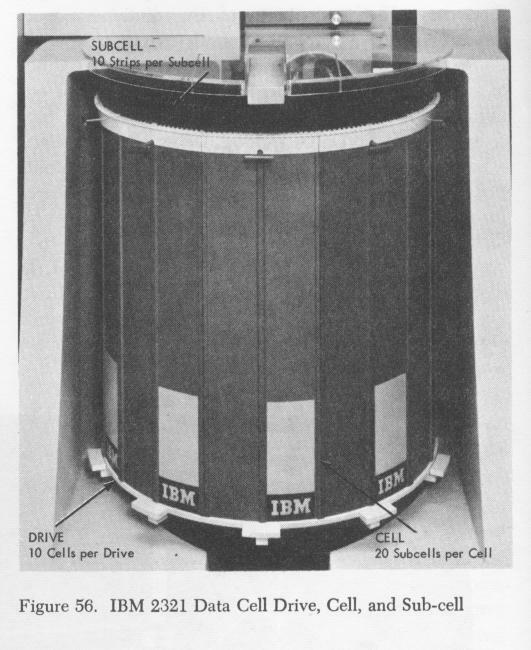 The motivation for building this monster was that disk drives were so expensive that putting 30 million drivers' license records on a hard disk was out of the question (and tapes were too slow for real-time lookups). Magnetic core memory for S/360-65. 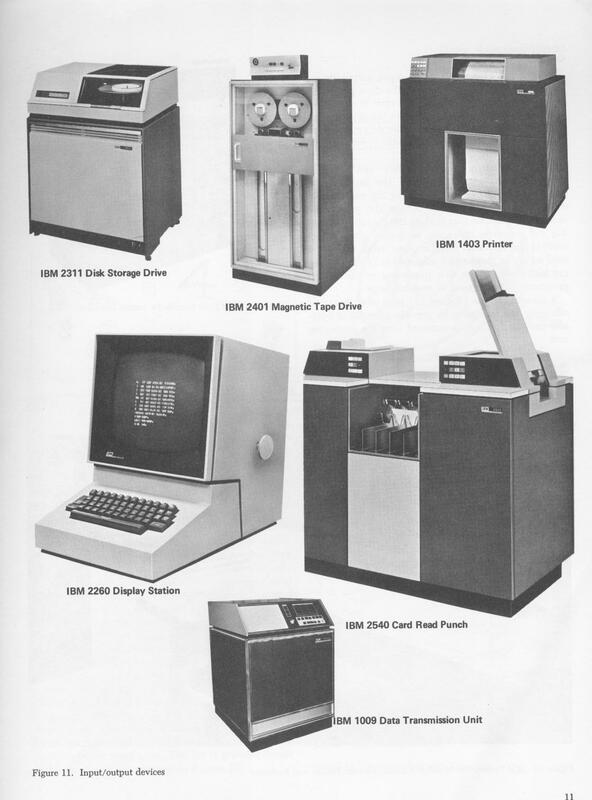 Tape drives used in early System/360 models. Also available as an RPQ feature for 1130 computer systems. We had two of these on an 1130 at Copenhagen University in 1970. Tape drive with integrated control unit for S/360. 600 cpm and 1000 cpm versions. Used on S/360 and 1130. Photo at Howard Shubs' Website. Card reader/punch used on S/360. 1000 cpm reading, 200 cpm punching. Photo at http://www.beagle-ears.com/lars/engineer/comphist/c20-1684/fig011.jpg Note the long feed ramp. Same 5 stacker pockets as the 1402. Often pronounced as the Mother-F*cking Card Mangler. Two input hoppers, 5 output stackers and a program-controlled card path between them. Telecommunications Control Unit (TCU) for S/360. The 2701 was the first TCU for the S/360. It supported only a few lines, but had an RPQ that allowed T1/E1 lines (up to 2MBps). Until the 1990s, this was the only IBM controller that supported T1 line speeds. TCU for S/360. Supported up to 16 (32?) low-speed lines. TCU for S/360. Supported up to 128 lines. Communications Control Unit for S/360. Interactive terminal used for word processing. The 2740 and 2741 were similar, but I remember the 2741 best. The keyboard and print mechanism were based on the IBM Selectric office typewriter, and the whole setup was built into a pedestal that could be extended with a small cabinet on either side to make a desk for a typist. I wrote a terminal driver for using these under Univac EXEC-8 operating system at Copenhagen Unviersity in 1972, but we had already had the terminals for a couple of years before that. Tape Control Unit for S/360. Used to attach 2401 drives. Unit Record Preipheral Control Unit for S/360. Used to attach 1403 and 2540 to multiplexer channel. 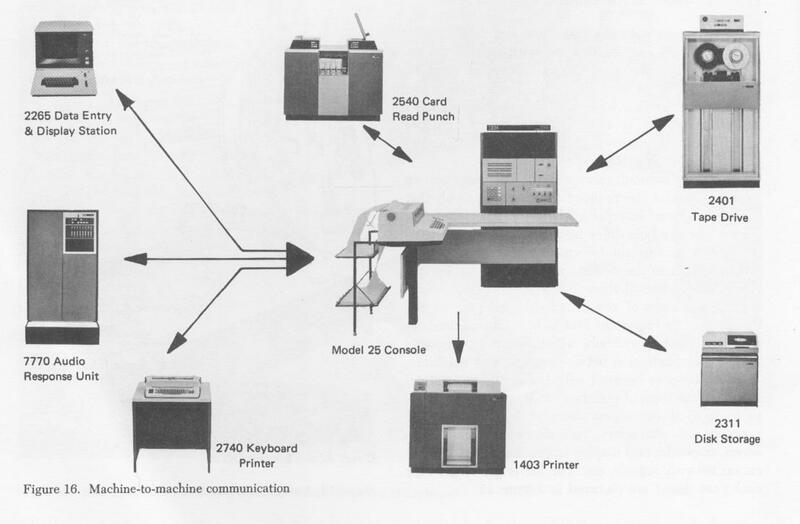 Typically, the 1052 console typewriter would be at I/O address 009, the printer would be at 00F and a second printer at 00E. Tape reader control unit used to attach 2671 to S/360. DASD Control Unit for S/360. Used to attach 2303 drum, 2311 disk and 2321 Data Cell. Display cluster controller for 2260 display heads. Used an acoustic delay line to hold the screen buffer. 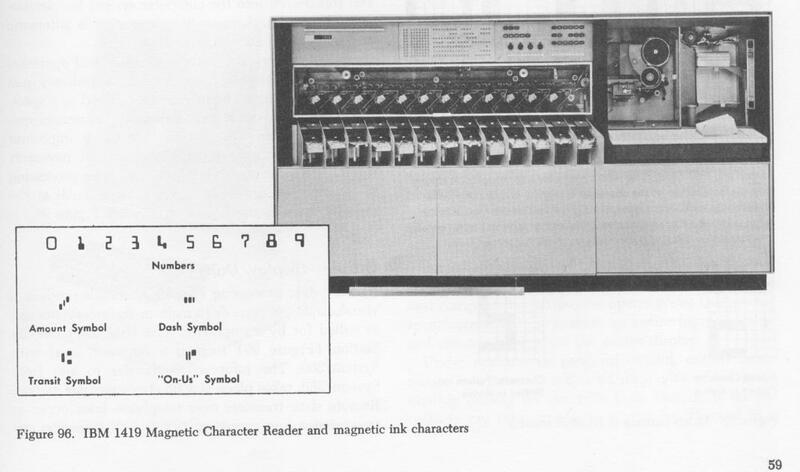 The character generator used a magnetic core ROM to hold the character dot matrix lookup table. DASD of S/370 vintage. 100 MB per drive. Used controller model 3830. DASD of S/370 vintage. Used controller model 3830. Prints on fanfold or roll stock and will optionally cut sheets. 30 inches of linear paper per second, or 3.5 pages per second (about 200 pages per minute). A robotic tape storage system, featuring tape cartridges about the size and shape of a 12-ounce soda drink can, containing a wide strip of tape wound on a spool. The cartridges were stored in two facing walls of honeycomb-arranged slots. Mechanical pickers (one or two, depending on the 3850 model) went back and forth between the storage walls, moved vertically and pivoted to reach the desired slot, then pulled a cartridge and carried it to one of multiple tape drive stations. 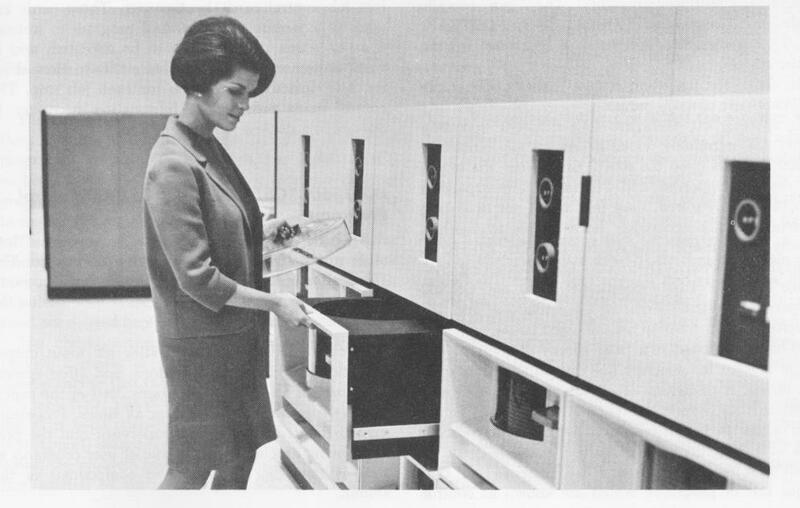 At the drive, the cartridge cover was removed and the tape was read or written using helical-scan heads like those on a 4mm or 8mm digital tape drive. Each cartridge held about 50MB, a 3330 drive image filled two cartridges. 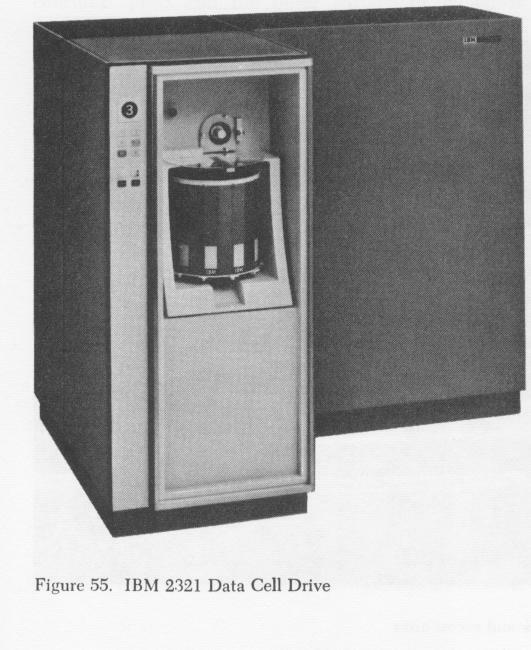 There were dedicated 3330 disk drives onto which data was staged from cartridges. 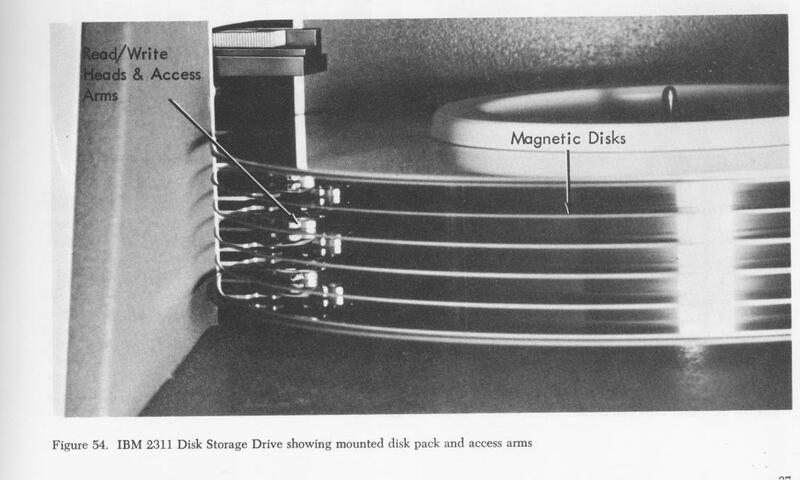 Once staged, the data was accessed from the 370 mainframe like ordinary disk data. The entry-level 3850 had a total storage capacity of 35GB, but a fully-expanded system could hold much more (up to 472 GB). After the 3330 DASD went out of fashion, 3830 MSS systems were fitted with 3350 drives, but the 3830 code was never updated to use the additional capacity of the newer drives. Portable computer (1976). 50 pounds, $10,000. Personal Computer - the original IBM PC (1981). 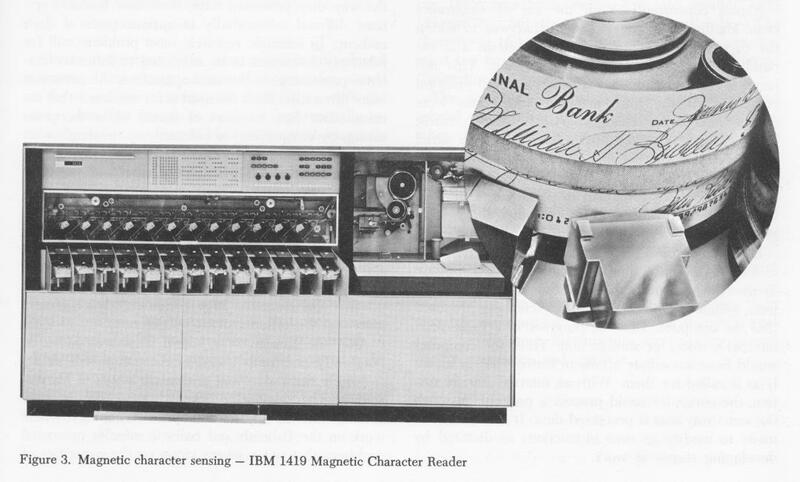 Started out as IBM copier 3, to which a computer interface was added (and a magnetic card reader input device). The 7090 was a transistor realization of the same architecture that was previously built in vacuum tubes as the 709. Core Storage - 16KW x 72 bits (64 data+8 ECC) used with 7090 and Stretch system. Field Service did not like these at all. Audio Response Unit used with S/360. The 7950 Harvest combined a modified 7030 Stretch processor with a 7951 processsing unit. S/390 G5 CPU cluster. 9672-R56 is 5-cpu, 9672-R66 is 6-cpu. Added a list from IBM Brazil. Yet more model numbers from a.f.c readers. More models from an anonymous source. Al Kossow provided many 70x and 70xx peripherals.